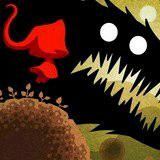 The Red Running Hood is in a hurry through the forest – she is going to visit her old Granny. But on her way she found out that the angry wolves have captured all rabbits in the forest and put them into cages. Release the poor bunnies and try to collect all apples for your grandmother.